Gently steamed Wholegrain rice with beans and peppers. 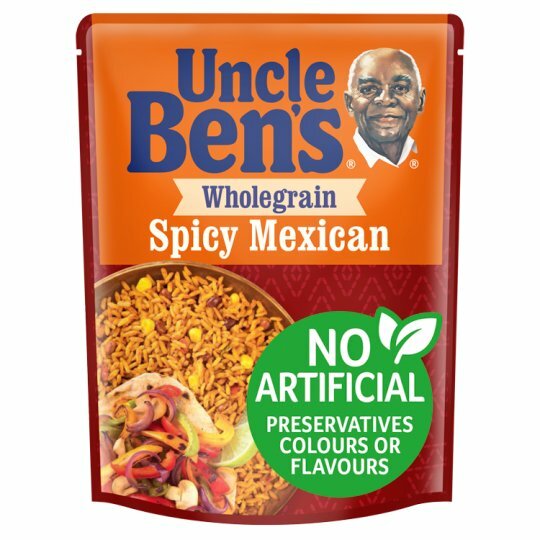 Our authentic Wholegrain Spicy Mexican rice, with carefully selected red peppers, chillis and adzuki beans (and a bit of Uncle Ben's® know-how). Simply no need for artificial flavours, preservatives or colours. Store in a dry place at room temperature., Once opened refrigerate unheated rice up to 3 days. Why not try our Wholegrain Spicy Mexican Rice with chicken fajitas - for a tasty meal in no time.